New Zealand Football’s national futsal competitions will have a fresh look when the action starts up again next year. 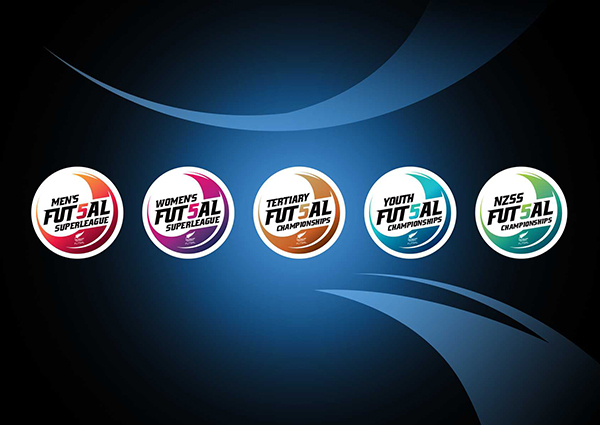 The five competitions – previously referred to as the Futsal National League, Women’s Futsal National League, National University Futsal Championships, New Zealand Secondary Schools National Futsal Championships and the National Youth Futsal Championships – will now be known as the Men’s Futsal SuperLeague, Women’s Futsal SuperLeague, Tertiary Futsal Championships, NZSS Futsal Championships and the Youth Futsal Championships. The logos for each competition have also been revamped for a more modern look that reflects the entertaining, fast-paced nature of the small-sided version of the beautiful game. Josh Margetts, Futsal Development Manager for New Zealand Football, is delighted to usher in an exciting new era as futsal continues to go from strength-to-strength in this country. “Futsal is a sport that has grown at a rapid rate and now occupies a significant space in the New Zealand sporting landscape,” he says. The appeal of futsal was recently underlined by the popularity of the Futsal National League, which will now be known as the Men’s Futsal SuperLeague. Crowds continued to grow all over the country while thousands more tuned in to catch the live streaming. That increase in interest comes on the back of a period of unprecedented growth for futsal in New Zealand, which just a decade ago was a largely unrecognised, low-participation sport with minimal national organisation. In the years since, New Zealand Football has turned the running of the sport into a fully-integrated, well-managed operation. It now runs as a department of the national body, which rolls out the sport through futsal development departments in each of the country’s seven regional football federations. There are now nearly 25,000 registered futsal players in the country and it is one of the fastest-growing team sports in the secondary school system. This exponential growth is set to continue as the development of futsal is a key priority for New Zealand Football in its 2016-2025 strategic plan. “There are exciting times ahead for futsal and the potential of the sport in this country is massive,” Margetts says. The honour of kicking off the new-look competitions will go to the Women’s Futsal SuperLeague, which takes place in mid-February in Wellington and will be swiftly followed by the NZSS Futsal Championships at the end of March. The Tertiary Futsal Championships are pencilled in for soon after in April while the Youth Futsal Championships are set for July. The Men’s Futsal SuperLeague will wrap up the year after kicking off in mid-October.